Hundreds of thousands of people cross the Fraser River via the Port Mann, Patullo, Alex Fraser and Golden Ears bridges every day, but very few of them are aware of the fish passing below them. One species in particular—the white sturgeon—is the largest freshwater fish in North America and has managed to survive since the time of the dinosaurs. Unfortunately, due to overfishing and habitat destruction, its continued survival is threatened. In his book A Ghost in the Water author Terry Glavin documents overfishing and subsequent collapse of Fraser River sturgeon populations in the late 1800s. By 1900, the fishery had collapsed and barely one-tenth of the sturgeon remained. For the next hundred years the remaining fish, and their descendents, were largely left to fend for themselves, until all sturgeon killing was finally halted in 1994 after 34 large sturgeon washed up on the banks of the Fraser River in the fall of 1993. Dr. Marvin Rosenau, a provincial fisheries biologist, spent the next two years searching for an answer to the die-off, but after rigorous testing he could only say that the deaths resulted from an “event”. One of the most alarming aspects of this “event” was that no one knew how many sturgeon there were left to protect. The Fraser River Sturgeon Conservation Society (FRSCS) has spent more than the past decade investigating issues that affect the recovery of Fraser River white sturgeon using data collected through a volunteer tagging and recapture monitoring program. They have also focused their efforts on a curriculum based education program and increasing public awareness to increase understanding of white sturgeon. 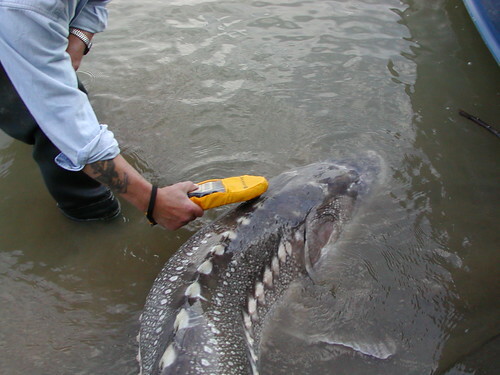 Fraser sturgeon are also of great historical importance to the Kwikwetlem First Nation and in 2008, Watershed Watch partnered with Kwikwetlem, the FRSCS and LGL Consulting Ltd. to conduct an acoustic telemetry survey of Fraser sturgeon in the lower Fraser and Pitt Rivers. This work was supported by the Gateway Program to help investigate sturgeon movement near the construction of the new Port Mann and Pitt River bridges.